in TV and ads, and the disconnect between the faces we see on screens and the reality of the Australian population. 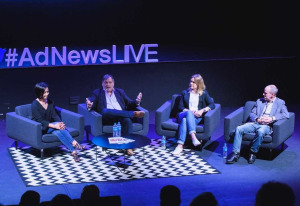 AdNews journalist Arvind Hickman moderated the panel and was joined by Adrian Swift, head of content production and development at Channel Nine, John Turnbull, strategy manager at SBS, Tara Ford, executive creative director at DDB Sydney and Dai Le, founder of DAWN. The AdNews Podcast is sponsored by The Trade Desk, and produced for us by Nova Entertainment. Listen to the podcast on iTunes, through the iPhone podcast app or via Soundcloud below. To read more stories from the event click here. Welcome to the latest edition of the AdNews Podcast. We know the best part of our job is the conversations we get to have with the smartest people in the industry every day - so this is our way of sharing that with our audience. This special edition was recorded live at our AdNews Live! Reframing Australia event in November. We’re turning the sessions into a podcast series that you can tune into this week. Keep an ear out for the next one later this week. In this session, experts from across television, advertising and business, talk about white washing in casting in TV and ads, and the disconnect between the faces we see on screens and the reality of the Australian population.